HUMUS for HAMAS was CENSORED between 26:48 till 27:00! 12 seconds have been cut of from the original film by the censor of “The 11th MOQAVEMAT International Film Festival“ in Teheran. 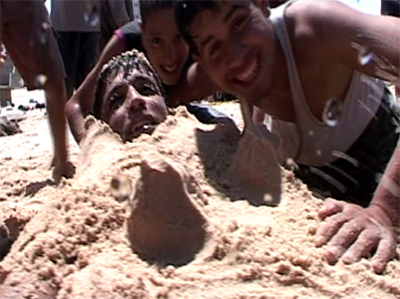 The sequence shows Palestinian boys burying one of their friends on the Gaza Beach. Only the head sticking out of the sand. who lack the real contact. I was not told, that the film was liable to censorship. I never imagined something like that could happen! I sat with two of my filmmaker friends and only one other spectator in a theatre of 90 seats, ready to show them the funny clip. In vain as I found out. The 11th MOQAVEMAT had censored 12 seconds of 52 minutes movie. The film was fitted with farsi subtitles going into great detail but nobody attended the film. Of course we discussed this at every meal. I was even told I didn’t have to see my movie if I didn’t want to, that I was not obliged to attend. But I wanted to see Humus for Hamas with Farsi subtitles and have questions asked from the audience! It happened to all of us: No attendance. Did they not inform the wider public about the international participation or did the moviegoers boycott government organized film activities? How come then that Iranian movies had full house and a staircase higher in the same building the foreign films were running in front of nobody? Our interpreters were clearly embarrassed and the organizers didn’t show up to face our questions.